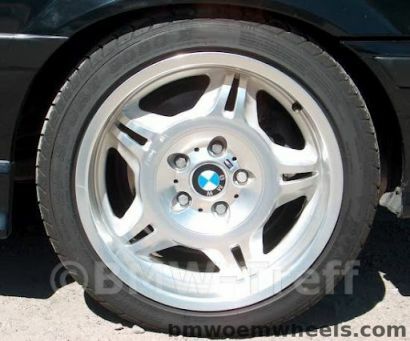 BMW Style 24 wheels were first introduced in 1994 as an optional wheel for the E36 M3. These wheels came standard on the limited production E36 M3 LTW in 1995 which is the model M3 that made these wheels gain some real recognition. Style 24's came only in 17-inch diameter with 7.5 inch wide fronts and 8.5 inch wide rears. The offset is ET+41 and each front wheel weighs 8.94 kg (19.71 lbs) with the rears weighing 9.48 kg (20.90 lbs) each. Although an inch difference in width, both the front and rear wheels use the same tire dimensions of 234/40-17. Each wheel produced was individually inspected using X-ray and precision balanced after forging and machining, as a result some wheels show evidence of grinding on the inside get true balance. Official wheels name M Double Spoke.